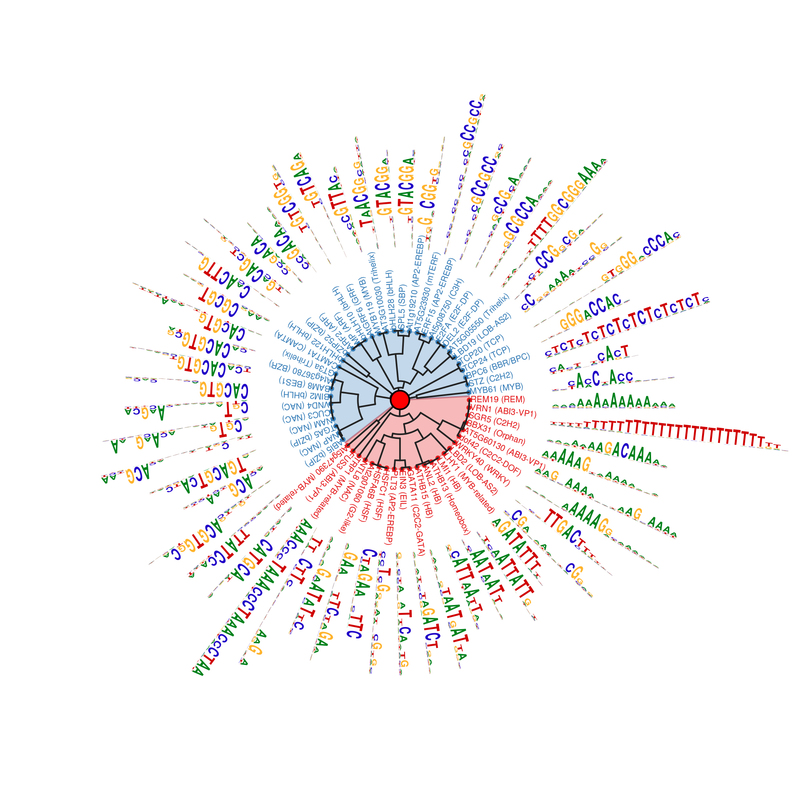 This graphic shows 57 short sequences of DNA where transcription factors bind to control genetic activity. In their study, Salk Institute scientists identified 529 such patterns of DNA, providing a rich source of information to understand how genes are controlled. Lots of information in plant and animal cells is contained in “coding” stretches of DNA that have the instructions to make proteins, the physical workhorses of cells. But researchers are increasingly realizing that other sections of the genome have elements that control when and how cells make these proteins. Among these “non-coding” bits of DNA are spots where proteins called transcription factors bind to manage the activation of neighboring coding genes. 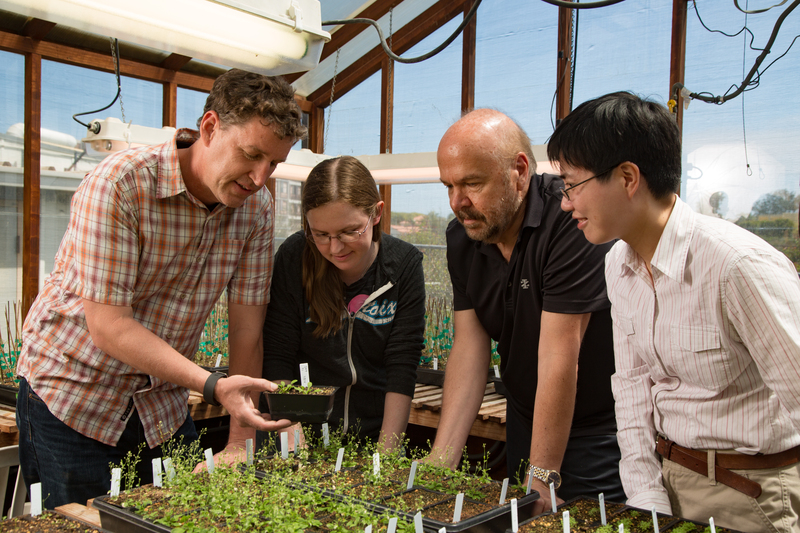 In the past, scientists could determine where just one or two transcription factors at a time were attaching to plant genomes, but the experiments were slow going. Ecker and his colleagues wanted to fully map where the hundreds—or even thousands—of known transcription factors bind, so they needed a faster way to map the sites. To achieve this cistrome mapping, the researchers created a system where they could add a tagged transcription factor to a library of DNA, let it bind and then isolate all the DNA-protein pairs. The method, called DNA affinity purification sequencing (DAP-seq), vastly expands how much more information scientists can glean about transcription factors and their binding sites. “Our system is inexpensive and scalable,” says Ronan O’Malley, a staff scientist in the Ecker lab and co-first author of the paper. “It allows us to capture the full collection of transcription binding sites so we have a complete codebook.” Moreover, he said, it doesn’t require sophisticated or specialized laboratory equipment that most plant labs wouldn’t already have access to. To test out the utility of DAP-seq, Ecker, Huang, O’Malley and their colleagues mapped where 529 transcription factors bound to the genome of Arabidopsis thaliana, the plant most studied by scientists. They identified 2.7 million binding sites. They then repeated the experiments using DNA containing or not containing cytosine methylation—a process of marking the genome’s surface with chemical methyl tags to further inhibit or activate genes. The binding patterns of about three-quarters of the transcription factors that they tested changed. “This allowed us to expose binding sites that we might miss if we didn’t remove the methylation. With this approach we can see binding sites that may be active in only a subset of cells or tissues,” says O’Malley. The new results show not only how regulatory proteins alter gene expression, but the roles the epigenomic methylation marks may play in this regulation. In a separate paper, published May 2016 in Nature Plants, Ecker and collaborating groups at Duke University and the University of Western Australia revealed that different types of cells in the Arabidopsis root have different patterns of methylation. Using DAP-seq, they’ll now be able to study how those patterns in root cells affect the binding of transcription factors. In addition, they would like to study how different transcription factors interact with each other, and try applying the method to other plant species and to human cells. Other researchers on the study were Liang Song, Mathew G. Lewsey, Anna Bartlett and Joseph R. Nery, all of the Salk Institute; and Mary Galli and Andrea Gallavotti of Rutgers University. The work and the researchers involved were supported by grants from the National Science Foundation, the Gordon and Betty Moore Foundation and the Howard Hughes Medical Institute. Ronan C. O’Malley, Shao-shan Carol Huang, Liang Song, Mathew G. Lewsey, Anna Bartlett, Joseph R. Nery, and Joseph R. Ecker of the Salk Institute; Mary Galli and Andrea Gallavotti of Rutgers University.